ALTHOUGH, as reported on this page in April 2013, Alderman Doug Butterill became a Royal Horticultural Society (RHS) Ambassador, working throughout the North West, he said in June 2015 that his title had been changed to Champion. No, that doesn't mean he has won anything or beaten anyone - as he is constantly having to explain. He is now championing the work of the Sherbourne Estate in Crewe. It is just that the RHS are now using the title of Ambassador for nationally-known people such as Alan Titchmarsh, Mary Berry, James Wong, Nick Knowles and Adam Frost. To add to the confusion the Ambassadors are championing the RHS and - in the case of Mary Berry - growing your own food! ALDERMAN DOUG BUTTERILL has become an Ambassador. But, no, he won't be off to some foreign country to represent the U.K. This is a Royal Horticultural Society appointment with Doug "working" through North West in Bloom. For instance, he will be encouraging people living on the Sherbourne Estate in Crewe to take an interest in gardening. Doug (left) said it was "hopefully just the first of local communities, villages, towns or cities I may become involved with in the North West." Doug will not be responsible for the scheme. "That will be up to Wulvern Housing and the local community," he said, "but I will be giving guidance and encouragement as required." 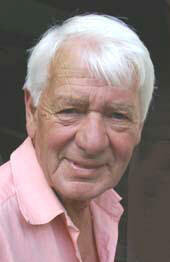 AT Nantwich in Bloom's Annual General Meeting on April 18, 2013, Doug stood down as Chairman - a post he has held twice. He said: "I first joined Nantwich's 'Britain in Bloom', as it was then called, in May 1979 and became Chairman about three years later. Work and council duties forced me to retire as chairman about three years after that, but I became chairman again in 2006." He will not be a member of the Nantwich in Bloom committee but "I will liaise with schools and be particularly involved with the Nantwich Riverside and liaise with Arriva Trains (for whom Nantwich in Bloom looks after the flowers on Nantwich Railway Station - winning a number of Best Kept Station awards) and, of course, with Greenspaces South Cheshire CIC (of which he is Company Secretary)." Doug suffered a serious back injury in 2012 and then found himself in hospital with another problem a few months later. But he was back in action for the dedication to the man whose idea it was at Nantwich's Community Orchard in the Riverside. And, not surprisingly, he is now getting on with some gardening at home. Before he retired, Doug was in business as a landscape gardener.